Released March 30, 1953: JEOPARDY, starring Barbara Stanwyck, Barry Sullivan, and Ralph Meeker. Directed by John Sturges (The Sign of the Ram, The People Against O’Hara, Bad Day at Black Rock). Barry Sullivan embarks on a family road trip deep into Baja California with his wife (Barbara Stanwyck) and young son (Lee Aaker). Stanwyck’s opening voice over expresses the joy of taking to the open road, and conveys the wonderment of Tijuana’s carnival-like atmosphere and desolate openness of Baja California. It all sounds delightfully optimistic and freeing until they stop to camp at an isolated beach where Stanwyck’s narrative turns ominous as she describes a dilapidated old jetty that will soon play a big part in ruining the family vacation. Things go awry when Aaker explores the jetty and gets his foot stuck in the planks. After Sullivan climbs out to rescue him, a portion of the jetty collapses, pinning Sullivan’s leg under a large piling at the waters edge. Unable to free himself, Sullivan instructs Stanwyck to drive back to an abandoned gas station they passed earlier to find some heavy rope. Meanwhile Sullivan remains trapped at the beach with Aakers, as the steadily rising tide threatens to submerge him. The family’s plight only gets worse when Stanwyck encounters a murdering escaped convict (Ralph Meeker) at the empty gas station. On the run from the police, he wastes no time kidnapping Stanwyck and commandeering her car. Despite Stanwyck’s pleas, he refuses to go to the beach to save Sullivan. The remainder of this rather short film focuses on Stanwyck’s attempts to convince the violent and selfish Meeker to help save her husband, while at the same time, the film’s flaws gradually become apparent. Since half the movie was spent setting up the family vacation, very little time remains to properly build drama around Stanwyck’s predicament. 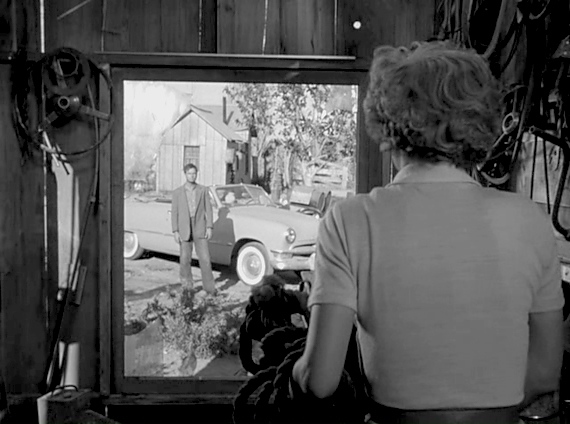 We get short vignettes of Stanwyck and Meeker driving the dusty roads of Baja California, interspersed with lackluster scenes of Sullivan helplessly pinned at the beach. The lack of in-depth storytelling results in many missed opportunities to generate tangible suspense. For example, early in the film we are deliberately shown Sullivan’s gun being placed in the glove compartment of the car, signaling this will be important later in the story. But when Meeker kidnaps Stanwyck, he stumbles onto the gun almost immediately and takes it for himself, eliminating any tension around its potential use by Stanwyck. It would’ve been much more interesting to keep the gun hidden for a time, holding out hope that Stanwyck might get to it. One can imagine how Alfred Hitchcock might have leveraged this situation far more adeptly. Another aspect that undercuts the edge-of-your-seat involvement is Stanwyck’s defiantly tough character. We desperately want to see her overcome Meeker and we share her disappointment each time she is thwarted, but her character is so emotionally resilient, that she barely seems affected by her situation. In one scene, she even takes a casual cigarette break with Meeker. With subtle indication that’s typical of the era, it’s intimated that Meeker eventually takes advantage of Stanwyck sexually, but even this is initiated by Stanwyck as a means of trying to save her husband. While it’s encouraging to see a strong female lead on screen, Stanwyck’s lack of emotional vulnerability only mitigates her sense of peril and thus, our involvement. The final blow that cripples this film is the unexpectedly abrupt about-face by Meeker in the movie’s closing scene. For no credible reason, he suddenly chooses an honorable course of action, disregarding his previously well-established selfish impulses. This sudden bad-guy/good-guy flip is not only out of place, but it robs us of the satisfaction of seeing a reprehensible villain get his comeuppance at the height of his deplorable worst. In the end, Jeopardy offers a mildly suspenseful story, highlighted by some attractive scenery of Baja California, but ultimately the film leaves us asking, “Is that all there is?” We give Jeopardy 2 out of 5 fedoras. To receive our posts via email, enter your email address and click Subscribe.